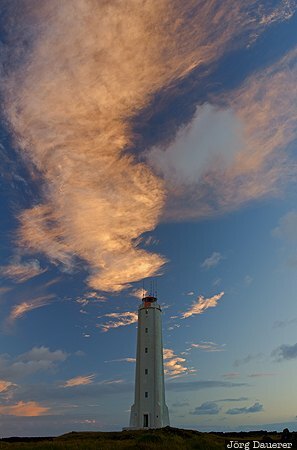 Malarrif Lighthouse on the Snæfellsnes Peninsula below colourful sunset clouds. The Snæfellsnes Peninsula is in Vesturland in the west of Iceland. This photo was taken in the evening of a cloudy day in September of 2013. This photo is part of the exhibition Lighthouses of Northern Europe (Oct'15). This photo was taken with a digital camera.